It’s true that something as simple as a good hair day can boost your confidence almost instantly in ways that other things can’t, but a good hair day can’t happen without first having damage free healthy hair. On a day to day basis, we often forget how delicate our hair is, and it’s important to be conscious of the things that we may not realise we are doing that can keep us from having those envy-worthy hair days. Heat is one of the most common sources of damage that we tend to engage with the most on a consistent basis. It’s important to use a heat protectant product and be sure that the heat isn’t turned higher than needed. Every now and then, don’t be afraid to let your hair air dry, or wait until your hair is at least halfway dry before grabbing your styling tool. We suggest using a leave-in treatment like KEVIN.MURPHY’s LEAVE-IN.REPAIR to protect your hair from heat while preventing breakage and nourishing it with ingredients such as Jojoba Seed Oil, Green Pea Protein and Bamboo Leaf Extract. Not all hair products have the same result from one person to the next. We believe your hair is as unique as you are, so it’s important to use a proper at-home care regimen suited to your unique hair and desired results in order to let your hair live to its fullest potential. We love using KEVIN.MURPHY’s REPAIR regimen with the weekly use of a cleansing conditioner such as RE.STORE, to pack your hair with powerful ingredients like Pineapple Fruit Extract, Papaya Enzymes and Green Pea Protein that will replenish and rebuild the hair shaft. 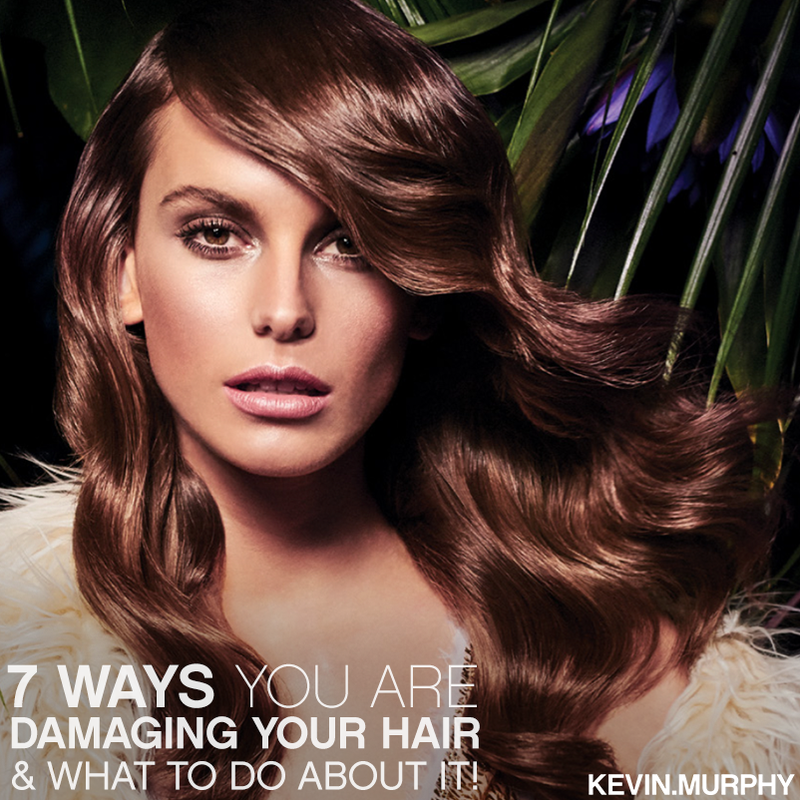 As much as we love being out in the sun, it can be very damaging to our hair. Be sure to protect your hair as much as possible from direct sunlight and harmful UV rays by giving your hair some rest in the shade or by wearing a hat in order to avoid drying out your locks and fading your hair colour. Speaking of colour, consistently bleaching and colouring your hair can be very damaging to your hair and scalp, depending on how often you go and what service you receive. Since many of us can’ go without colouring our hair, we suggest opting for a high performance, natural, Ammonia free colour range in order to maintain the integrity of your hair and scalp. Ask us about using COLOR.ME by KEVIN.MURPHY, to colour your hair while protecting and nourishing it with ingredients like Shea Butter, Honey and Pomegranate. COLOR.ME is also Ammonia free and PPD free to eliminate the need for harsh chemicals that are typically used to lift and lighten the hair. Like your skin, your scalp needs a little detox every so often. MAXI.WASH is a colour-safe exfoliating wash that gently cleanses and detoxifies your hair, removing excess mineral and product buildup with extracts from Pineapple, Papaya and Citrus. It’s important to use a detoxifying wash at least once a week to remove build-up and brighten up dull hair. Good hair and a healthy scalp are a result of taking care of your body from the inside. Be sure to stay hydrated and include vitamins and minerals in your regular diet to help nourish your hair from the inside to fight off any free radicals that can cause unwanted damage to your hair. In addition, getting enough sleep and making other positive lifestyle changes can have a noticeable impact on your hair. We often forget just how delicate our hair is, especially when it’s wet or already suffering from breakage and damage. Opt for a wide-toothed comb, or Wet Brush that won’t pull or snag your strands. We like using TEXTURE.COMB to neaten your hair and control frizz and fly-aways while maintaining the natural texture and movement in your hair. Additionally, avoid pulling your hair in tight styles, which over time can weaken your locks and lead to breakage. Next PostNext It’s Party Time at Melange!